The aim of this paper is to identify relative roles of different land-atmospheric conditions, apart from sea surface temperature (SST), in determining early vs. late summer monsoon intensity over India in a high resolution general circulation model (GCM). We find that in its early phase (June–July; JJ), pre-monsoon land-atmospheric processes play major role to modulate the precipitation over Indian region. These effects of pre-monsoon conditions decrease substantially during its later phase (August–September; AS) for which the interannual variation is mainly governed by the low frequency northward propagating intraseasonal oscillations. This intraseasonal variability which is related to mean vertical wind shear has a significant role during the early phase of monsoon as well. Further, using multiple linear regression, we show that interannual variation of early and late monsoon rainfall over India is best explained when all these land-atmospheric parameters are taken together. Our study delineates the relative role of different processes affecting early versus later summer monsoon rainfall over India that can be used for determining its subseasonal predictability. Summer monsoon precipitation plays a major role in the economics of the Indian subcontinent (Gadgil et al. 2004) where agriculture is the vital source of growth. However, an accurate prediction of the interannual variations of Indian Summer (June-September: JJAS) Monsoon Rainfall (ISMR) at least a season in advance remains challenging. It is more difficult to predict the extremes of monsoon precipitation—the most important aspect of interannual variation (Webster et al. 1998). The poor predictability of the seasonal mean ISMR could be due to the fact that the unpredictable internal dynamics plays a major role in determining its interannual variation. Interannual variation of sea surface temperature (SST) is considered as the primary forcing modulating the interannual variation of monsoon over India (Goswami 1998). Several studies show that there is a link between El-Niño and Southern Oscillation (ENSO) and the intensity of ISMR (e.g., Pant and Parthasarathy, 1981; Sikka, 1980; Rasmusson and Carpenter, 1983). Droughts are more probable during the warmer east Pacific SST phase (El-Niño). On the other hand, excess rainfall is more probable during the cooler phase of eastern Pacific SST (La-Niña). However, a strong monsoon-ENSO relationship came under doubt after some striking failures of the proposed linkage (e.g., during 1994, 1997 summer monsoon). Kumar et al. (1999) claimed that the relationship had been weakening since the last two decades. Moreover, there is an equal chance of having deficit and excess rainfall with El-Niño (Kumar et al. 2006; Gadgil et al. 2007). In the last decade, another link was found related to SST variations in Equatorial Indian Ocean (EIO) which is termed as Equatorial Indian Ocean Oscillation (EQUINOO; Gadgil et al. 2004). It was shown that ENSO and EQUINOO together can explain more extremes of ISMR as compared to ENSO alone. However, all the factors related to SST can explain at most 50 % of the variability in monsoon rainfall (Goswami and Xavier 2005). Hence, there could be many other reasons which are governing the rest of the 50 % of monsoon variability. Other than the impact of SST, there are pre-monsoon land-atmosphere processes which can play vital role in determining the interannual variation of monsoon over the Indian region. The Eurasian Snow cover is one of the most well-known among them (Barnett et al. 1989; Vernekar and Zhou 1995; Fasullo 2004; Ye and Bao 2005; Peings and Douville 2010). The pre-monsoon soil moisture (SM) is supposed to have an impact over the monsoon rainfall too (Shukla and Mintz 1982; Douville et al. 2001; Douville 2002; Eltahir 1998; Fennessy and Shukla 1999). Joseph and Srinivasan (1999) have shown that the 200 hPa meridional wind anomaly in May has a very prominent impact over the monsoon rainfall. The pre-monsoon surface moist static energy (MSE) also has relation with the upcoming monsoon rainfall (Chakraborty et al. 2006, 2014). However, a comprehensive study examining the relative impacts of these land-atmosphere parameters in determining summer monsoon over India in absence of interannual variations of SST forcing has not been reported so far. Therefore, it is necessary to separate the impact of interannual variation of SST from other parameters to understand the relative role of the later in determining interannual variation of ISMR. Such a study is possible using a general circulation model (GCM) forced by SST that does not vary interannually. The seasonal mean of ISMR depends on its relative intensity during early (June–July: JJ; climatological contribution 52 %) and late (August–September: AS; climatological contribution 48 %) phases. However, it has been shown by Terray et al. (2003) that the early and late ISMR intensities are uncorrelated, and it might be associated with the evolution of ENSO (Boschat et al. 2011, 2012). The non-existing relationship between the anomalies of early and late Indian summer monsoon could also be related to the fact that pre-monsoon conditions like the SM are more likely to impact the early part of the season (Saha et al. 2010) as compared to the later part when, after the onset, the internal dynamics is more likely to play a major role. Such changes in the dependence of monsoon rainfall on land-atmospheric conditions can have profound influence on the predictability of long-range as well as short- to medium-range forecasts which shows different rates of error growth over land as compared to the ocean (Chakraborty 2010). In this paper, we try to understand the relative role played by different important land-atmosphere parameters in determining the early and late ISMR intensities using a high resolution global GCM. We force the model with seasonally varying climatological SST conditions to eliminate the impact of the interannual variation of SST on monsoon rainfall. A brief description of the model used is given in Section 2. The experimental details are provided in Section 3, and the results are discussed in Section 4. Section 5 illustrates the use of a Multiple Linear Regression to find relative impacts of different parameters on Indian monsoon, followed by the summary and conclusions of the study. The atmospheric component of CCSM4 (Community Climate System Model 4) (Gent et al. 2011), the Community Atmospheric Model 4.0 (CAM4) (Neale et al. 2011), developed by National Center for Atmospheric Research (NCAR) is used for this study. The model has a finite volume dynamical core (Lin 2004). The horizontal grid has 384 × 576 latitude/longitude divisions resulting in a high resolution of 0.45∘ latitude and 0.625∘ longitude spacing over the globe. The mass flux scheme by Zhang and McFarlane (1995) is used for deep convection parameterization. The shallow convection scheme by Hack (1994) is used in the model. The model has 26 vertical layers. We perform a 50-year long simulation of the model. The boundary conditions over the ocean (SST) are forced from the climatological monthly mean values of Hadley Centre which is constructed by the Met Office Hadley Centre for Climate Prediction and Research (Rayner et al. 2003). Therefore, the model saw seasonally varying SST. However these values do not change from year to year. The CAM4 is coupled to a land surface model (CLM4) (Lawrence et al. 2011a) which allows it to interact with the atmospheric model throughout the simulation. For the observational analysis, precipitation data from three different sources are used. Those are the Climate Prediction Center Merged Analysis of Precipitation (CMAP) data (Xie and Arkin 1996) for the period of 1979 to 2015 at 2.5∘ × 2.5∘ resolution, the Indian Meteorological Department (IMD) monthly mean precipitation data (1971-2009) at 1∘ × 1∘ resolution (Rajeevan et al. 2006) and the TRMM (Tropical Rainfall Measurement Mission) 3B43 monthly mean precipitation data for the period 1998 to 2015 at 0.25∘ × 0.25∘ resolution (Huffman et al. 2007). The ERA 40 zonal wind data for 200 and 850 hPa are used as observational estimates of zonal wind during the analysis (Uppala et al. 2005). Correlation is used extensively during the analysis of the data. Hence, we mention that any correlation value above 0.28 can be considered statistically significant at 95 % level according to the two sided student t test for our sample size of 50 years. Figure 1 shows summer (June–September) precipitation climatology over south and east Asia from observational estimates of CMAP (1979–2015), TRMM (1998–2015), and the model simulation (50 years). The model is able to capture the high precipitation zones along the west coast of Indian peninsular, over northern Bay of Bengal, foot hills of the Himalayas and over the EIO. However, the intensity of precipitation to the west of the Western Ghats is higher compared to the CMAP estimates. This could be on account of high resolution of the model (∼0.5 × 0.5 degree) which is essential for capturing orographic precipitation along narrow mountains like the Western Ghats when compared to CMAP (2.5 × 2.5 degree). The proof of that is the close correspondence of the model climatological precipitation with the high resolution TRMM (0.25 × 0.25 degree) climatology over the Western Ghats. We also note that precipitation over the head Bay of Bengal is spread over a larger region with reduced intensity as compared to CMAP. Orographic precipitation south of the Himalayas in the model is closer to the TRMM precipitation. These features are similar to that when CAM4 was forced with interannual varying SST (Meehl et al. 2012). It is noticeable that the model is unable to produce the observed convection center over the Eastern equatorial Indian Ocean which is also apparent when the model is forced with observed SST (Islam et al. 2013). However, altogether, the model simulated a reasonable spatial pattern of summer precipitation climatology over the Indian subcontinent when compared to the observational estimates. 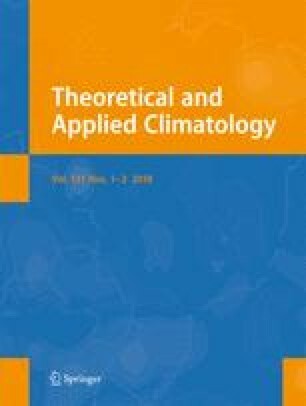 The pattern correlation of the model climatology over the region 70∘–90∘ E, 8∘–28∘ N (will be termed as Indian region in this paper) with the CMAP estimate and TRMM (Fig. 1) are 0.44 and 0.64, respectively, which clearly shows the improvement of observed estimates of precipitation pattern with increase in resolution. Variations within the season averaged over the Indian region (land part) is shown in Fig. 2. Highest precipitation in July and lowest precipitation in September (within the 4 months of the monsoon season), seen in the model simulation are similar to that in the CMAP estimates and TRMM. Albeit an overestimation, therefore, the sub-seasonal cycle is well simulated by the model. Noting, in the previous section, that the spatial pattern of the precipitation climatology and its sub-seasonal variation over Indian region are reasonably captured by the CAM4 model vis-a-vis CMAP observations, it is necessary to see if the model (forced by climatological SST) shows any significant interannual variation. Such variation in normalised ISMR for 50-years is illustrated in Fig. 3. On the time axis, the numbers are the corresponding years from when the model simulation started and do not directly correspond to any calendar year due to the nature of SST forcing (seasonally varying climatological). Despite the fact that SST does not vary from 1 year to other, there are large interannual variations in simulated precipitation over the Indian region. This result is consistent with the previous studies (Goswami and Xavier 2005; Krishnan et al. 2009; Saha et al. 2010). The 50-year mean ISMR is 10.8 mm day −1 and its interannual standard deviation is 0.72. The ratio of model standard deviation to its mean (7 %) is smaller compared to that observed (∼10 %). This could mainly be due to the fact that SST did not vary from year-to-year which is known to be the primary forcing for boreal summer monsoon interannual variation. There are 8 years (4, 6, 10, 20, 24, 31, 34, and 46) with seasonal mean precipitation anomaly below −1 standard deviation. We term these drought years of the model. Similarly, there are 8 years (22, 28, 29, 36, 37, 42, 49, and 50) with ISMR anomaly above 1 standard deviation. These are termed as flood years. We next compare the spatial precipitation pattern during the extreme years as compared to the observational estimate. Figure 4 shows the composite anomaly patterns of precipitation during June–September from the model simulation and observational estimates of IMD and CMAP. The composites from the model are based on 8 drought years and 8 flood years occurred during the 50-year run. The composites for CMAP are calculated based on the 6 drought years (1979, 1982, 1987, 2002, 2009, and 2014) and 3 flood years (1983, 1988, and 1994) appeared between 1979 to 2009. Due to the longer data period, IMD composites comprise another flood year (1975) and two additional drought years (1972 and 1974). In observations, the spatial pattern of anomaly during flood and drought years are coherent over the entire south Asia including Bay of Bengal. However, north-east Indian region shows opposite signs of anomaly during flood years in the composite pattern. There is an east-west dipole of anomaly along EIO in observations. This could be related to the Indian Ocean Dipole (IOD) and EQUINOO. However, the model simulated anomalies are coherent in east- west over the equatorial Indian Ocean. This could be related to the fact that the model was not forced by interannual variation SST that eliminates the east-west dipole pattern. Are those anomalies in precipitation in the model seen in Figs. 3 and 4 coherent within the season? From observations, it is known that precipitation anomalies over Indian region during the beginning of the monsoon season (JJ) are different than that at the end of the season (AS). This could be due to the fact that pre-monsoon land surface conditions play significant role in its early parts (Saha et al. 2010). However, once onset (all-over Indian region) is established, the conditions change due to feedback and precipitation anomalies during later part of the season becomes independent of the pre-monsoon conditions (Chakraborty et al. 2006). Figure 5 further supports the studies mentioned above. We note that there is no robust relation between JJ and AS rainfall anomaly over the Indian region in the model. For example, there are years (like 16, 12 and 42) when the JJ and AS anomalies are of opposite sign with large magnitude at least in one of those two parts of the season. The correlation between JJ and AS anomalies in the model is 0.13. Figure 5b shows corresponding statistics from observational estimates of CMAP during 1979–2015. There are years like 1984, 1991, and 1998 when anomalies during JJ and AS have large values with opposite sign. The correlation between these two pairs of months in CMAP estimates is 0.09. The above result indicates that the early (JJ) and the late (AS) phases of summer monsoon are possibly controlled by different mechanisms. Previous studies suggest that pre-monsoon conditions playing major role in the early parts of the monsoon compared to its later parts (e.g., Rai et al. 2015). Several pre-onset land-atmospheric parameters are shown to have impact during the monsoon. Based on previous studies, we identify the following parameters for further analysis in this paper: soil moisture (Rai et al. 2015), near surface moist static energy (Chakraborty et al. 2006), Eurasian snow cover (Douglas and Shukla 1976), and phase of upper tropospheric Rossby waves (Joseph and Srinivasan 1999). However, from previous studies, the relative importance of these parameters in early (JJ) and late (AS) phases of monsoon is not clear. In the following section, we investigate the role of these land-atmosphere conditions during JJ and AS separately. where C p is specific heat of dry air at constant pressure, L is latent heat of evaporation, g is gravitational acceleration, T is temperature, q is specific humidity, and z the geopotential height. Figure 6a shows the spatial correlation of MSE at 2-meter above surface in May with the June–July rainfall averaged over the Indian region for the 50-years of model simulation. It suggests a positive relationship between pre-monsoon MSE and JJ precipitation over the Indian region. The strongest relation comes over northern parts of peninsular India. Figure 6 shows the same with the AS rainfall averaged over India. The relation between MSE and ISMR has weakened from the corresponding JJ values, except that over western parts of the peninsular India. This could be due to the fact that the effect of MSE in May have greater effect with a smaller lead time (JJ) as compared to AS. Pre-monsoon soil moisture is another parameter which can govern the intensity of monsoon rainfall over India (Shukla and Mintz 1982; Douville et al. 2001; Eltahir 1998). Soil moisture has a positive feedback on rainfall. Higher the soil moisture higher the evaporation and it eventually reduces the height of the Planetary Boundary Layer (PBL) over that region leading to a more favourable condition for precipitation. Figure 7a shows the correlation of precipitation averaged over the Indian region in JJ with the soil moisture of the upper 10 cm layer of soil in May at every grid in 50-year model simulation. This figure shows a positive relationship between pre-monsoon SM and early monsoon precipitation. The correlation is stronger over the western parts of India and the southern India. This suggests a positive feed back between the advancement of monsoon onset isocrones and the soil moisture as pointed out by (Krishnamurti et al. 2012). According to that, wet (dry) land surface conditions before onset will help (restrict) the advancement of convective systems over land. Unlike that for surface MSE (Fig. 6), pre-monsoon SM has almost equal impact on precipitation during AS (Fig. 7b). However, the region of highest correlation in AS shifts to central India and western parts of Indian peninsula. Previous researches suggest that Eurasian snow cover in the winter as well as in spring has an impact on subsequent monsoon precipitaiton (Douglas and Shukla 1976; Vernekar and Zhou 1995; Bamzai and Shukla 1999). In winter or spring, most of the Eurasian region is covered with snow but the depth of the snow varies from year to year. As a consequence, the heat required to melt the snow varies from year-to-year which affects the vertical temperature gradient that influences the monsoon trough for its advancement towards the Indian region. Altogether, the previous researches suggested a negative relation between monsoon and snow depth over Eurasia. Figure 8 shows correlation of interannual variations of snow depth over northern Europe and Asia during March (representing spring) with precipitation over Indian region in the 50-year model simulation. Figure 8a shows regions with strongest negative relationship over Eurasia (60∘–80∘E) and eastern Asia (120∘–140∘ E) in JJ. However, the correlation is not significant at 95 % level over the Eurasian region where previous researches found a link with the ISMR. Moreover, there is mixed response over the Eurasian continent with prominent negative as well as positive correlations. Therefore, the proposed monsoon link with the Eurasian snow seems very weak in the model. A similar correlation pattern with AS precipitation over Indian region shows no strong negative correlation over Eurasia. This indicates that the Eurasian snow depth in Spring may slightly influence the early summer monsoon (JJ) compared to the later part (AS). It has been shown by Joseph and Srinivasan (1999) that a spatial shift in 200 hPa Rossby wave over south Asia in May can have a large impact on the subsequent monsoon precipitation. According to their study, when 200 hPa meridional wind anomaly in May is negative (positive) over Indian region, the possibility of having a good monsoon is higher (less). Figure 9 shows correlation of interannual variations of meridional wind at 200 hPa during May at every grid point with the June–September mean precipitation over Indian region in the 50-year model simulation. The positive and negative correlation patches seen in this figure are similar to that mentioned in Joseph and Srinivasan (1999). The impact reduces in August-September over the Indian region. Therefore, all the factors discussed so far have more effect on the intial phase of the monsoon (JJ) than the later (AS). Hence, there must be some other reason which is mainly affecting the end phase of the monsoon rainfall over the Indian region. It has been seen in Fig. 4 that precipitation anomalies assume opposite signs north and south of around 10∘ N over south Asia in the model simulation as well as in CMAP estimates. This see-saw pattern in anomalous precipitation is more evident in Fig. 10. This figure shows correlation of interannual precipitation over each grid point to that averaged over Indian region in June–July (left panel) and August–September (AS) separately. During June–July (left panel), strongest positive correlation is found over central India and Bay of Bengal. This is consistent with the fact that inter-tropical convergence zone (ITCZ) is usually coherent over these regions on interannual time scale. It can also be noticed that the positive correlation band extends eastward on to western Pacific Ocean up to about 150∘ E. On the other hand, a strong negative correlation of precipitation over south of 10∘ N and Indian region is seen in this figure. This negative correlation pattern extends from over Arabian Sea up to west Pacific Ocean and has the same longitudinal dimension as the positive correlation band. This result suggests a large scale see-saw of ITCZ between equator and northern parts of south-east Asia in the absence of interannual variations of SST. The spatial pattern of this correlation is stronger in August–September (Fig. 10b) as compared to June–July. Therefore, this precipitation see-saw response is playing the main role during the later phase of the monsoon. These results motivate us to investigate the combined effect of the factors which have relative role on the monsoon over Indian region in its two distinct phases. where MLRPA stands for multiple linear regressed precipitation anomaly, X 1 is for SM anomaly, X 2 is for SD anomaly, X 3 is for V wind anomaly, and X 4 is for the precipitation anomaly over EIO for the respective months of MLRPA. B, C, D, E are the corresponding coefficients of the parameter X 1,X 2,X 3,X 4. Since all the above mentioned parameters have different units, we have normalized their anomalies by their corresponding standard deviations to get unit less coefficients. A is the constant term which is almost zero while using normalised anomalies. i is the year index which runs from 1 through 50. Figure 11a shows the relation between MLRPA and the precipitation anomalies in JJ over Indian region for 50-years of model simulation. The MLRPA is able to explain most of the high anomalous precipitation years in these early months of the summer monsoon over Indian region. The correlation coefficient between these two parameters is 0.52. Figure 11b shows the same but without considering the factor of EIO precipitation anomaly in the MLR calculation. Note that the relationship between MLRPA and the precipitation anomaly in JJ is weaker in this case (r=0.40) as compared to when precipitation over EIO was considered (Fig. 11a). However, it is evident that there is reasonable association between MLRPA and precipitation anomalies in the early phase of monsoon without the EIO factor. Therefore, there is a considerable role from the precursory factors during this period. Figure 11c shows the relation of MLRPA with the precipitation anomalies in the later phase of the monsoon (AS) over the Indian region. Over this period, MLRPA explains the extreme precipitation years further better than the earlier phase of the monsoon with a correlation of 0.67. However, excluding the factor of EIO, the correlation drastically drops down to 0.19 which is much lower than the JJ period under the same condition. This feature indicates that in the later phase of the monsoon, EIO precipitation see-saw is the most important factor behind the monsoon precipitation variability over the Indian region. Figure 12a shows the same for the case of JJ and AS together i.e for the whole monsoon period (JJAS). In that case strikingly the correlation becomes 0.72. From the normalised coefficient values, it can be clearly seen that EIO precipitation is the most impact-full factor throughout the JJAS period (see Table 2). Excluding the EIO factor, the correlation drastically drops down to 0.27 (Fig. 12b). As a whole, the beginning phase is controlled by the EIO and the precursory effects both and the later phase is mostly governed by the EIO only. However, we still need to understand the reason behind this EIO precipitation response to the ISMR. This EIO precipitation and Indian region monsoon rainfall see-saw are apparently due to the variations in the northward propagation of the convective cloud bands within the season, i.e., the Intra Seasonal Oscillation (ISO). The more cloud bands propagate northward towards Indian sub-continent, it rains more over Indian region and less over EIO and hence can create a precipitation see-saw. Figure 13a and b is showing the northward propagation on 70∘–95∘ E longitude for two drought years (24 and 46) in the model. It shows lesser north-ward propagation with clear breaks and more elongated breaks over the Indian latitudinal belt with respect to the two flood years (22 and 42) nCC in Fig. 13a and d. In case of drought years, the northward propagation is mainly lesser in the later phase of the monsoon when we see the major impact of the EIO precipitation see-saw. Therefore, the impact of the ISO is stronger in the later phase of the monsoon in the model. Jiang et al. (2004) proposed a mechanism for the northward propagation of convective cloud bands based on the vertical shear of the zonal wind. Here, we verify that proposed mechanism in terms of flood and drought years of the model. The difference of zonal wind between 200 and 850 hPa averaged over 70∘–95∘ E is shown for the JJ, AS, and JJAS period in Fig. 14a, b, and c, respectively. The black line denotes the climatological pattern of the shear in the model. The flood year (red) and the drought year (blue) composites show distinct difference in shear over the latitudinal band 5∘–25∘ N. Figure 14d, c, and f shows prominently the difference in wind shear for the flood and drought years when the climatology is removed from the shear for JJ, AS, and JJAS period. During the drought years, the shear is significantly low over the zone where the northward propagation is prominent in the model (10∘–20∘ N). This figure also suggests that the intraseasonal oscillation is more prominent in AS phase of the monsoon. Figure 15 shows the relation of the zonal wind shear averaged over 5∘–15∘ N with ISMR. In the model, it shows a strong negative correlation (r=−0.53) with the zonal wind shear. However, this relationship is weak in observations (r=−0.18). Nevertheless, in case of observed drought years, the relation of the zonal wind shear to ISMR is quite similar to that in the model. The differences occur mainly in case high monsoon rainfall years. It could be due to the absence of the interannual variations in SST in the model and further studies with observed SST forcing might be able to address this aspect in more depth. Land-atmosphere conditions determining early (JJ) and late (AS) monsoon intensity are different when SST does not vary interannually. Pre-monsoon (May) surface moist static energy, soil moisture, and phase of upper tropospheric Rossby waves play pivotal role in determining the intensity of precipitation during subsequent June–July. Among those, the upper tropospheric Rossby waves play the biggest role. Low frequency intraseasonal oscillation, arising out of internal dynamics of the system, remains a decisive factor throughout the monsoon season. However, during the early phase of monsoon, their impact is reduced on account of increased role played by Rossby waves, MSE, and soil moisture. The weighted combination of all these parameters explains the interannual variability of monsoon better than any single parameter. The summary of this study is illustrated in Fig. 16. While, in July–August, precipitation intensity is equally determined by the pre-monsoon 200 hPa Rossby wave phase and intraseasonal oscillations, the August–September monsoon precipitation is primarily a function of the intensity of intraseasonal oscillation (which is linked to vertical shear of zonal wind). Since the intraseasonal oscillation arises due to internal nonlinear dynamics of the atmosphere-ocean system, our results show that predictability of monsoon should be higher during the first half of the season as compared to the second half. This is important in terms of real-time prediction of seasonal monsoon precipitation and calls for further studies. Open access funding provided by Max Planck Society. R. S. Nanjundiah acknowledges the support from INCOIS (Indian National Centre for Ocean Information Services) under HOOFS (High-resolution Operational Ocean Forecast and reanalysis System) programme for this research. The National Monsoon Mission (NMM) and CTCZ (Continental Tropical Convergence Zone) programme of Ministry of Earth Sciences (MoES) are acnowledged by A. Chakraborty for their financial support. We thank the anonymous reviewer for the constructive comments which enhanced the quality of the paper.